‘Millo is the world’s quietest blender. Thanks to the revolutionary magnetic drive technology, we have been able to design a blender that’s 3 times quieter than a standard device. 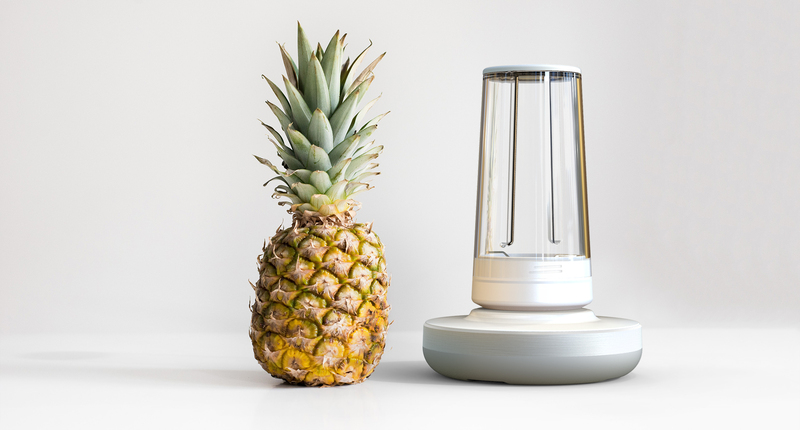 Combining groundbreaking brushless technology with our own patented magnetic clutch, Millo enables a new way to blend at home – it’s so powerful, it can easily (and quietly) crush ice cubes or nuts, making a perfect smoothie.’ – says Aivaras Bakanas Co-Founder of Millo, Lithuanian startup, so don’t miss this chance to find out more! It’s a smart device – you can control Millo via an app, select and save recipes, track your nutritional information and do a host of other things. One of Millo’s most appreciated features, though, is that it’s portable – the cup that you blend in is the cup that you drink from, making it incredibly easy to just blend and go. We hope that Millo will ignite a new smoothie-on-the-go trend, helping fitness affectionados and those concerned about their health ditch the processed foods and switch to fruits and veggies. Last but not least is Millo’s safety programme. We have implemented a three-level security system that incorporates simple mechanical as well as electronic solutions to prevent accidents at home. It’s probably the safest blender on the market, too. Frankly, there aren’t many. The innovative technologies at the core of Millo design are not cheap and aren’t widely used in regular home appliances. Add to that our unique approach to product design, and you have a device that features powerful tech and looks like something from a magazine. It’s certainly not your standard juice maker that lives in the bottom drawer. We believe that’s how we can make a real difference – by improving the existing technologies and habits that make our routines. Unlike some of the big brands that churn out new products just for the sake of adding new revenue streams, we actually live and breathe the idea of making a positive impact on people’s lives. So when you try Millo, you will definitely experience the difference. It’s a pretty simple reason – Millo is a product we wanted but couldn’t find on the market, so we invented it. Smoothie is a great way to get healthy calories you need for training, which often happens to be early in the morning. So you often need to choose between blending a smoothie or waking up the entire neighborhood – and that’s a problem we have set out to solve. Ruslanas Trakšelis came up with the concept of Millo in 2016, however, the real work didn’t start until 2017, when 4 business angels decided to invest in the idea. Soon after that, we ran a successful Kickstarter campaign, confirming the gap and need in the market. As it often is in the startup world, the main challenge was probably finding the right people and building a strong team. Once that’s in place, you simply focus on getting things done. If we look at the end consumer, then there a few distinct groups. First, the health-conscious group of people who choose healthy food for themselves and their families, even on the go. Then, we also have the athletes and fitness affectionados who need a fast and convenient way to get their healthy calories and nutrients. And finally, we have the office workers who are seeking out healthier, better ways to snack and fill in the gaps between lunch and late dinner. Our goal is to start from the English-speaking markets and then move into the biggest European markets. But we know that the healthy fast food option is needed everywhere, so we certainly have plans to take Millo global as soon as we have a strong presence in Europe. In terms of business partners (customers), we are looking to team up with businesses that offer real added value for brands and premium products in a similar way as we do. We have to be able to demonstrate to the end customer the real value and benefits they’re getting with Millo, so branding, positioning and demo is very important to us. As far as blenders go, Millo is a groundbreaking innovation, so we need a partner who could exclude it from a regular “box moving” process and would be able to sell innovation. We know there are added value distributions and retailers out there, so we will be looking to partner with them. When you’re creating a new product from scratch, you risk to get caught in the infinite loop of improvements – if you don’t set some kind of deadline, you might end up never releasing the product. It’s a huge challenge to understand, in a broader sense, what is critically important to the end customer and what is just a nice-to-have as well as to achieve certain specifications and continue developing the product further when you’re working with new technologies. So, on one hand, you want to create a perfect product, but on the other, it needs to be reasonably priced and still offer great value to the consumer. The team has raised their first investment of €100,000 from four angel investors. The money was used to fund the development of the first Millo smoothie maker for the mass market. As soon as the product was measuring up to the market standards, we launched a successful crowdfunding campaign on Kickstarter, achieving its initial target of £80,000. Besides the always-welcome injection of capital, we have also confirmed market demand for a well-designed, innovative smoothie maker, and this has opened the doors to a second round of investment! A year later, in June 2018, a group of business angels and a Co-Investment Fund have invested an additional €453,000 to help prepare Millo for mass production. So, at this point, we are good to go and about to reach the mass production stage. Today we are working on the last business angel round to ensure initial demand and produce more units initially. Ruslanas Trakšelis is our founder and CEO. He is the one who initiated the Millo project back in 2016. Co-Founder Aivaras Bakanas has recently joined the team as Chief Commercial Officer, after 5 years of working on the Deeper Sonar project, where he was part of the management team overseeing the product’s sales and business development. The Deeper Sonar product went from 0 to 10M Eur turnover and developed active partnerships in more than 30 countries. We also have our own experts from mechanics and construction engineering areas – Audrius Bražėnas and Ben Šulcas, who holds a masters in electronics engineering. Rolandas Babrauskas, who is responsible for writing the firmware code, is “the brain” of the blender, while Moses Kang is behind Millo’s design. We haven’t started selling yet. We’re planning to kick off sales in early Q3 2019, so that’s still ahead of us. But the trends we’re seeing – the vegan culture and people investing more and more money and effort into healthy nutrition in general – demonstrate a huge potential. And that’s where the Millo solution can make its mark. We’re just starting out, so can’t say much without giving away too much. But we are driven to instill a smoothie culture among people and have this trend in all homes and on the go. We have big plans.